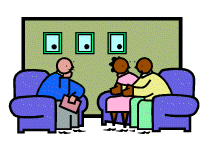 At the first appointment, we will talk about what is going well with your life, what you are struggling with, what you are hoping for from our sessions, and how you will know when you have achieved your therapeutic goals. I may ask you to complete questionnaires in order to help us to understand your difficulties in more detail. When we have gathered enough information, usually over one to three sessions, we will decide on a treatment plan together. This will include the areas to work on, our goals, the methods we will use, the time and money commitments we will make, and any other relevant things. We will look together at our progress and goals at regular intervals. If we think we need to, we can then change our treatment plan, its goals, and/or its methods. Therapy is an active partnership. This means that we both work together to achieve the agreed goals. It also means that you will need to put time and energy into this outside of our sessions. For example, I might ask you to keep written records of specific things, or ask you to carry out specific tasks designed to help you to practice the new behaviours that you are learning. Change may happen quickly, but more often it happens slowly, which can be frustrating. Unfortunately, there are very few quick fixes, but it is possible to learn new ways of looking at and dealing with your problems that will help to make life more manageable and more enjoyable.